» Bike bridge — an idea too far out? 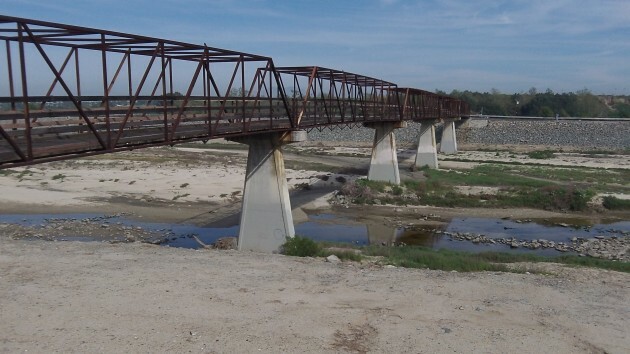 Bike bridge — an idea too far out? 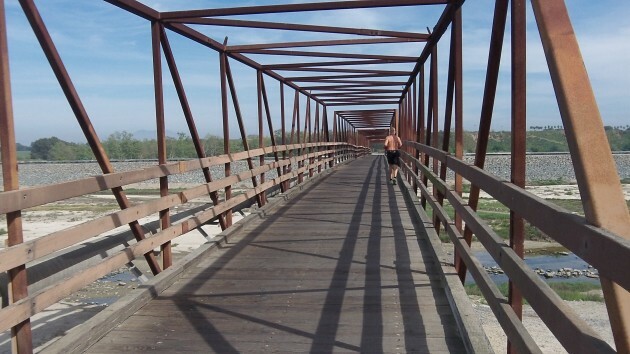 This bike and pedestrian bridge crosses the Santa Ana River. It’s wishful thinking, I know, but a bike bridge across the Willamette River might actually avoid all kinds of other complications as the search continues for a more or less direct Albany-Corvallis Trail. As you may recall, Benton County hopes to identify a new corridor for this much-anticipated trail after the county planning commission shot down its plan to route it along the Albany-Corvallis railroad tracks. In a commentary, I suggested some alternatives. That prompted a commenter to ask why we can’t consider a bridge across the river. After all, he reasoned, Eugene has several of those, so why can’t we have one? Well, the likely cost is one reason. Getting a bridge approved is another, considering that the aproaches would have to cross what no doubt are actual wetlands. Still, there are existing roads on both sides of the river that are rarely used and could be adapted as bike routes without needing a whole lot of work. And because they are already there, using them to ride a bike presumably would not require conditional use permits for crossing exclusive-farm-use land. All this came to mind the last couple of days as I was sailing along the all-but-deserted bike paths along and near the beaches of Orange County. In particular, there’s a bike bridge across the Santa Ana River that made me wish that such a thing could be feasible across the Willamette. This crossing seems almost superfluous, considering that there are wide highway bridges with bike lanes within a mile or so in either direction. Superfluous or not, the bridge is of a simple structure. Wooden planks make up the deck. It does not look like an engineering marvel that was difficult or exceedingly costly to build. A Willamette River bridge, of course, would have to be built to deal with enormous amounts of water rushing under it, a challenge that the Santa Ana does not present except perhaps during a winter flood.